The Delaware County Historical Society is pleased to be able to preserve these historic buildings in Delaware County. We are even more pleased to open them for community access. They are part of the rich heritage of Delaware County Ohio. The Meeker Homestead comprises the Forrest Meeker House and The Garth Oberlander Barn (The Barn at Stratford). Here you can learn about our historic buildings and the long history they share. 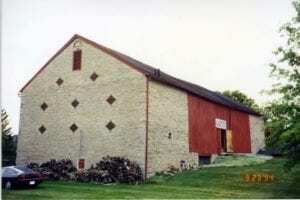 The stone-end bank barn was built two stories tall and the main portion measures 84′ by 36′. It is a fine example of a Sweitzer Forebay barn, a type traditionally associated with the middle Atlantic area of early America, specifically Pennsylvania. The foundation and stone end walls were laid of squared and coursed limestone rubble from the plentiful deposits of limestone at and near the surface in the immediate area and visible at the banks of the nearby river. The massive timber structural elements, many of which can easily be seen from inside the barn, are the hand-hewn products of the first-growth surrounding forest, which was being cleared at a rapid pace at that time. The roof, now covered with standing seam metal from the late nineteenth century, was originally of wood shingles. Forrest Meeker left his birth state of Vermont in 1797 and tried settling in Pennsylvania, Southern Ohio, and Kentucky. President John Adams awarded 4000 acres of land to Nicholas Gilman for military service in 1800. Around 1804 Meeker and his wife, Patience, had lived in Chillicothe, however by 1810 they were living in Bourbon County, Kentucky. Patience “could not endure the institution of slavery” and persuaded Forrest to move back to Ohio. The first person to inhabit the property was John Beard, who purchased 624 1/4 acres from Benjamin Gilman in December 1807. He settled on the west bank of the river, where he built a log cabin and a grist mill (in 1808). In February 1811, Meeker purchased from John Beard 624 partially cleared acres along the west bank of the Olentangy River, including a wooden grist mill. As a result of military activities related to the War of 1812, the war with England that our new nation had just become embroiled in, traffic along the river road was busy, as it was one of several practical routes to Sandusky, Detroit and western Lake Erie where much of the interior conflict with the British and their loyalists took place. Meeker had his grist mill working day and night to supply the army with flour, and he and Moses Byxbe, founder of Delaware in 1808, became major suppliers of provisions to the war effort. 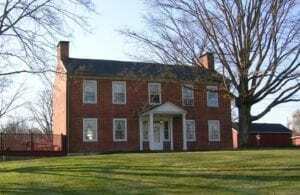 With profits from the mill operation and farming, supplemented by contracts for supplying William Henry Harrison’s army during the War of 1812, Meeker was able to build a large brick house in 1823. Constructed as a Federal-style I house, originally there were only 2 rooms on either side of the center hall, the basement below and the 2 bedrooms above. The trees used in building the Meeker House were felled in the winter of 1822, and the front, main body of the house was probably constructed shortly thereafter, around 1823. In 1838, the mill was sold to Judge Hosea Williams and Caleb Howard, who established a paper mill on the river. In April 1845, Meeker sold the remaining 624 acre farm to George Bieber for $10,150. George Bieber had emigrated from Pennsylvania to Ohio. The beams in the barn are from trees cut in the winter of 1847 and used in construction of the Pennsylvania German barn structure, probably around 1848. Forrest Meeker died May 16, 1849 and was buried in Stratford Cemetery on what had been his homestead (Now Stratford Ecological Center). Bieber died in 1854 and the administration of his estate was handled by his sons James and George. The property went through several splits and changes in ownership among his heirs and others. The property was acquired by the A. C. Miller Co. (which later became Union Fork and Hoe, Inc.) Records show that the homestead was operated as a farm by tenants. Garth Oberlander purchased 210 acres, which included the house and barn, from Union Fork and Hoe for $10,000 and farmed it for several years. Garth Oberlander began his antique business. Tom and Carolyn Porter joined Garth Oberlander in the antique business and were mentored by him. Garth moved into an apartment on the upper floor of the barn. 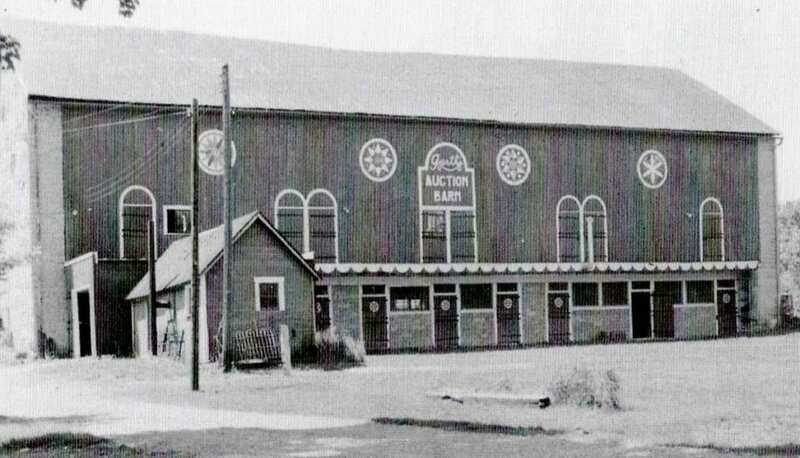 Following Garth Oberlander’s death in 1973, the Porters bought the auction business and the property. They improved and enlarged the enterprise into a nationally acclaimed antiques auction house. When the Porters retired, the auction business continued under the direction of Jeff and Amelia Jeffers. The Porters sold the auction business, but not the real estate, to the Jeffers. To this day, Garth’s is regarded as one of the top auction firms in North America with annual sales approaching $10 million. Tom and Carolyn Porter, being committed historic preservationists, contracted with Skilken Company, a Columbus development company who promised to develop the property without demolishing the historic buildings. After many months of complex negotiations, a partnership was forged between the Porters, Turkey Hill Minit Markets, and the Delaware County Historical Society. The partnership allowed the redevelopment of a two-acre portion of the site into a sensitively designed convenience store and gas station, while the remaining six acres and all the historic buildings were donated to the Delaware County Historical Society. The Historical Society operates the house as a museum, with offices in the lower level. 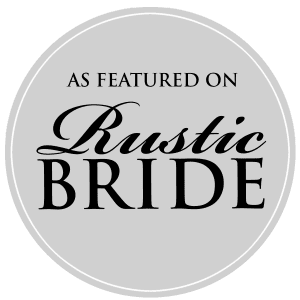 The barn is now a wonderful special events venue and educational facility, The Barn at Stratford. The two story brick house was built overlooking the river and is an excellent example of an early Federal style “I house”, a simple form that was a rectangular two story house with a gabled roof. They normally had two rooms down and two rooms up, with the entrance hall and stairs in the middle, and chimneys at either end. The 200-year-old house remains in a remarkable state of preservation, inside and out. The windows and doors are mostly original to the construction, and the interior woodwork is walnut, painted in the formal parts of the house. The recesses surrounding the fireplaces have original wood cabinetry with paneled doors and trim, and the floors in the old portions of the house are original ash planking. The Forrest Meeker House, one of the oldest and most prominent historic buildings in Delaware County, is now a fine educational museum. The Meeker Homestead Museum hosts an exhibit about the early settlement of Delaware County and changing feature exhibits.